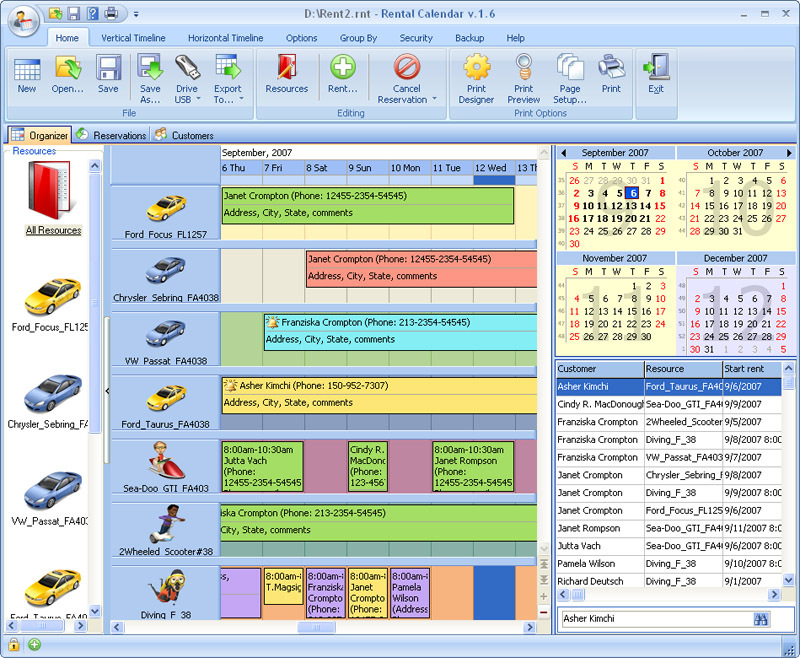 This is a more powerful version of Rental Calendar, with all of the features of the standard version, but with the additional capability to share data in real time over the network. Rental Calendar is designed for individuals, small and mid-sized businesses, operating in the rental market. With this software, renters can organize rental activities, keep track of rental units and plan to rent out resources, avoiding associated problems. The program has a handy interface to calculate and show the term of lease, professional events, helping you to make decisions quickly without having to search in endless paper notes, looking for time available for rent. The program has searching and sorting options to let users easily handle records. Rental Calendar is great to store and keep track of calendars for unlimited number of rental units, such as DVD disks, cars, bikes, boats, scooter, planes, houses, etc. With only one mouse click, you can back up or protect the database with a password. Date Navigator lets you view records for any particular day with a click on the day in the calendar. The program is designed to enable the communication between different scheduling applications. You can save appointments into an iCalendar file with the .ics extension. It facilitates data transfer between applications that use Scheduler and other applications, such as Apple iCal, Microsoft Exchange Server, Novell GroupWise. There is also an opportunity to prepare reports for printing or exporting to other formats: PDF, XML, HTML, XLS and TXT. You pay for the program only the first time and get all new versions of this program for FREE and for a lifetime! Recent Changes: This release includes minor enhancements.